Current technological advancements offer many ways of enhancing disabled peoples’ access to cultural heritage environments. A new generation of social computing technologies and systems is changing the way in which we access cultural heritage, facilitating the inclusion of socially isolated groups of people. 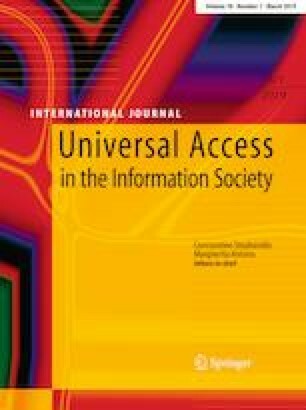 Under this perspective, this paper aims to explore the potential impact of social computing systems to enhance peoples’ access to cultural heritage, particularly focusing on deaf and disabled users. By reviewing the current literature on social computing and cultural heritage, the paper first summarizes the related applications and appropriate key technologies; second, it provides examples of innovative approaches to the enhancement of user engagement and interaction through social computing. Moreover, the paper highlights arising issues of privacy, as well as ethical considerations, and presents design principles for ensuring privacy. The study concludes by discussing challenges for inclusive social computing applications in the context of cultural heritage and pointing out areas where future research is needed. Part of the work in the context of this paper has been the result of PhD student exchanges between CUT and FORTH-ICS, funded in the context of the European Union’s Horizon 2020 Framework Programme through NOTRE project (H2020-TWINN-2015, Grant Agreement Number: 692058).